Why should I buy a pressure cooker? What's the difference between an electric and a stove top pressure cooker? How do I choose between an electric and a stove stop pressure cooker? How much should I spend on a pressure cooker? What size pressure cooker should I buy? What else should I know when buying a pressure cooker? 1. Why should I buy a pressure cooker? There has never been a better time to upgrade your kitchen with a pressure cooker. While pressure cookers back in the old days were tied with memories of kitchen explosions (just ask baby boomers for any post-World War II pressure cooker they might have had in the kitchen), today's generation of pressure cookers has been innovated enough to ensure safe use and more advanced options for your convenience. The most beneficial thing about having a pressure cooker is that it significantly cuts down on cooking time and is, in fact, the fastest method for cooking healthy and delicious meals. How long should you cook a 2 kg chicken? In a pressure cooker, 15 minutes. What about a creamy dish of risotto? Around 10 minutes. So how exactly does a pressure cook do this? Basically, a pressure cooker builds pressure from steam in the pot, thereby cooking food at above boiling temperature. This allows food to be cooked 70% faster than other methods of cooking, and consequently, less energy is used. Tests reveal that the energy saved is 40% on an electric or gas stove and up to 75% in a conventional oven. Less energy used, lower bill, more money saved. Not only that, a pressure cooker is also known for tenderising even inexpensive cuts of meat for tasty dishes. You can also cook dry beans rather than buying canned products. All this is good for your budget bill. Pressure cooking requires less water compared to other conventional types of cooking, which means that more vitamins and minerals are retained. Additionally, lack of exposure to air prevents oxidation of the nutrients in the food. Bottom line: a pressure cooker is a great accompaniment to your healthy cooking efforts in the house. The key to tasty dishes prepared in a pressure cooker lies in the sealed environment. This prevents the loss of flavour and moisture in evaporation. So food retains its natural flavour, which is why a potato will keep its natural potato and earthy taste. Also, since moisture is maintained, foods don't dry out and meats are cooked juicy and tender. Worried about safe food? The heat in a pressure cooker kills most harmful micro-organisms such as bacteria and viruses. Unlike cooking on a stove top or in an oven, using a pressure cooker means that heat stays in the pot, so the kitchen remains cooler. Additionally, the covered lid prevents mess in the kitchen, saving you the trouble of cleaning up, plus minimum cooking smells. Finally, you might be thinking, do I need another appliance sitting in the counter top? Thankfully, a pressure cooker is a versatile piece in the kitchen. It can double as a pot and a pan; you can use it to prepare a full three-course meal, ranging from appetizers to desserts. All these time, healthy, and financial benefits make a pressure cooker a true great investment in your kitchen. 2. What's the difference between an electric and a stove top pressure cooker? Now that you've decided to invest in a pressure cooker, you have two options: an electric pressure cooker or a stove top pressure cooker. Both of these prepare food in a short time using pressured heat, but they also have significant differences. To summarise your options without getting too technical, an electric pressure cooker provides ease and convenience with its automated features, while a stove top pressure cooker provides accuracy in cooking with its manual regulation of heat. In addition, stove top pressure cookers are better long-term investments compared to electric pressure cookers. Replacement parts and repair services for stove top pressure cookers are easily available, while in the event that an electric pressure cooker fails after the warranty period has expired, it may be difficult or uneconomic to obtain spare parts or get the cooker repaired. One of the main differences between an electric and a stove top pressure cooker is in the built-in heating mechanism. While a stove top pressure cooker needs a separate heat source, an electric pressure cooker can stand on its own, as it has its own integrated heating component inside. 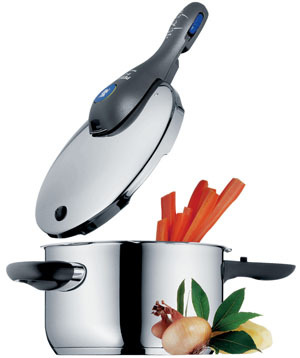 A stand-out feature of an electric pressure cooker is its convenient digital timing technology. This means that, with the preset digital timer, you can cook dishes from start to finish without having to keep an eye on the whole process. An electric pressure cooker also autoregulates heat and pressure, so you don't have to manually adjust the heat on the stove top. One of the reasons to purchase a stove top pressure cooker is its manual heat regulation. This is especially important in searing, wherein you can simply brown the food, and then seal and cook with pressure. Searing with an electric pressure cooker is relatively more difficult, since you have to bring the unit to the right “browning” temperature and then cancel the function and re-start to complete the cooking. Other advantages of a stove top pressure cooker over an electric one includes faster time to come up to pressure. A stove top pressure cooker also allows you to do the quick cold water release method, which immediately stops the pressure cooking – a special consideration when steaming fish and veggies. Furthermore, stove top pressure cookers operate in the range of 8-15PSI (pounds per square inch), with 15PSI being the value required for most published cookbooks and recipes, while electric pressure cookers reach pressure in the 10-11PSI range. The higher pressure in a stove top pressure cooker also means that it can cook food faster. If storage is an issue, a stove top pressure cooker is also the better option, as an electric pressure cooker is bulkier and occupies more space. A stove top pressure cooker can also be used as a stockpot and a saucepan. With its durable stainless steel material and easy spare parts replacement, it also has a higher life expectancy. 3. How do I choose between an electric and a stove stop pressure cooker? To put it simply, your choice depends on your needs. It's definitely more convenient to use an electric pressure cooker, since you only need to press a few buttons and then walk away. It will automatically switch off and keep the dish warm until serving. It is mainly this “set-and-forget” setup that gives an electric pressure cooker its appeal. A stove top pressure cooker, meanwhile, allows you to control heat manually for best optimal results. It also offers a large range of sizes to suit the family size (from 4 to 22 litre models) and type of cooking. You can't go wrong with either of the two, but in the end, it all boils down to what you consider is more important to you. 4. How much should I spend on a pressure cooker? A pressure cooker should be considered an investment rather than just another pot you want to own, for the reasons given above as much as for your own cooking pleasure. There are many different companies manufacturing pressure cookers in a wide range of prices, so there's something for everyone. Given below is a list of the pros and cons of each type of pressure cooker, according to price, to help you decide. Buy a stainless steel cooker with a sandwich base (a layer of aluminium sandwiched between two layers of stainless steel to improve heat conductivity for better cooking). 5. What size pressure cooker should I buy? The size of the pressure cooker you'll need depends on who you'll be cooking for, and how often. Always keep Vickie Smith's recommendation in mind: “While even the largest pressure cooker is capable of cooking the smallest amounts of food, large amounts cannot be cooked in a small one.” All pressure cooker sizes indicate their full liquid capacity, but in reality, only half to two-thirds can be really used to cook. Never fill the pot more than two-thirds its capacity, as pressure cooking involves frothing and bubbling, which may block the steam valves when the pot is too full. This is good for singles or couples, as whole meals can be cooked for two here. It will also do for one course to serve a small family. The normal pressure cooker size for an average family with 3-5 members. It can accommodate a full meal recipe, but is not too bulky to store. The ideal pressure cooker size for large families with more than 6 members, or if you often cook for large groups of people, or like to freeze food. These larger ones are generally used for pressure cooking large amounts of food that you want to store in jars or pints, for catering purposes or any other semi-commercial venture that requires you to cook for more than 15 people at a time. 6. What else should I know when buying a pressure cooker? Most pressure cooker recipes call for cooking at 15 psi, so check that your pressure cooker is capable of reaching this level. Otherwise, add 10% more cooking time for a 12-13 psi pressure cooker and 20% more time for an 8-9 psi cooker. You're going to use your pressure cooker for many years, so do a quick check on pressure cooker companies, and the warranties they offer. Usually, replacement parts for your cooker are not covered in a warranty, so go for a company that always has replacements and accessories in stock. For stainless steel pressure cookers, the best quality ones are those marked "18/10 stainless steel". This means the stainless steel is composed of 18% chromium and 10% nickel, which makes it more durable, resistant to stains, rust and corrosion, shinier and easier to clean. Many recipes call for the use of accessories such as a steamer basket or cooking rack, so you'd get the best value for your money if you buy a pressure cooker that already comes with one or two of these accessories. If you purchase a large pressure cooker, look for one with two side handles. The pots with food in them get heavy, so it's easier to lift and handle a pressure cooker with two handles. If folding handles are available, you'll require less storage space. Non-stick pressure cookers are not highly recommended. Non-stick surfaces don't last long, and will show signs of wear and tear soon. Currently, only electric pressure cookers have non-stick pots, which can be replaced when needed. 7. What can I cook in a pressure cooker? One of the great things about a pressure cooker is that you can cook so many different things in it! Just remember to stick to the measurements indicated in recipes. Stews and curries are the most popular pressure cooker recipes, as the ingredients are fairly easy to prepare. Tough cuts of meat become really tender when braised or cooked in stew in a pressure cooker. Vegetables and legumes that normally take longer to cook like dry beans, potatoes and carrots are easily softened in a pressure cooker. You can use the pressure cooker, uncovered, to brown meat and vegetables for an added flavour before putting liquids in. Rice and risottos will cook perfectly every time. Poached or steamed fruit will make delicious and healthy desserts (and are perfect for baby food). Steamed puddings and cheesecakes using seasonal fruit will delight the samily all year long. 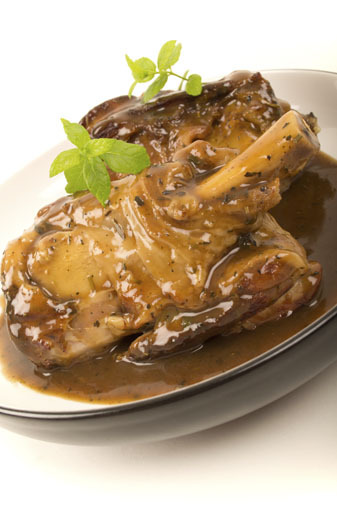 There are some excellent recipes that pressure cooker novices and experts alike will enjoy!